Gazprom supplied a total of 193.9bn m³ of gas to Europe and Turkey in 2017, its CEO Alexei Miller said on 3 January, beating previous record from 2016 by 8.1%. Gazprom supplied a total of 193.9bn m³ of gas to Europe and Turkey in 2017, its CEO Alexei Miller said on 3 January, beating the previous record of 2016 by 8.1%. The record monthly exports were achieved in January 2017. 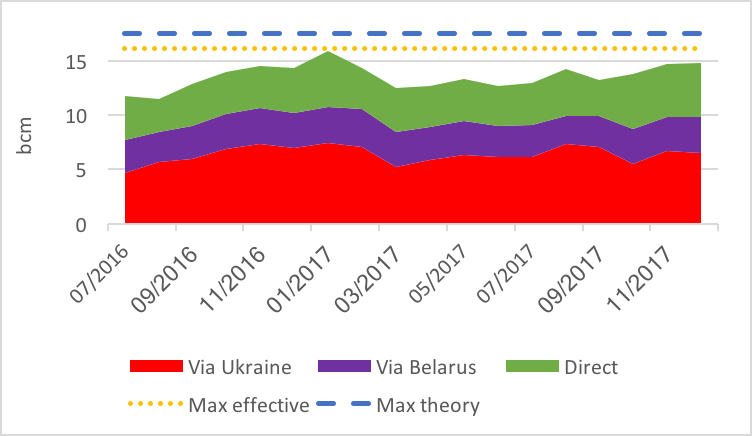 Following the Baumgarten blast on 12 December 2017, the daily flows via Ukraine were reduced by about 80mn m³ (29%). Flows via Belarus and direct flows were unaffected by this accident. As repeatedly stated Gazprom strategy is not to flood the EU market but to adjust volumes to maximise its revenues, which is a function of volumes, prices and competition. In December, Gazprom exported 1.1% more gas than in November to balance the EU market. The year on year growth was 3.5%, showing that with further demand growth and domestic supply curtailment, the 2017 record could be followed by another record in 2018. 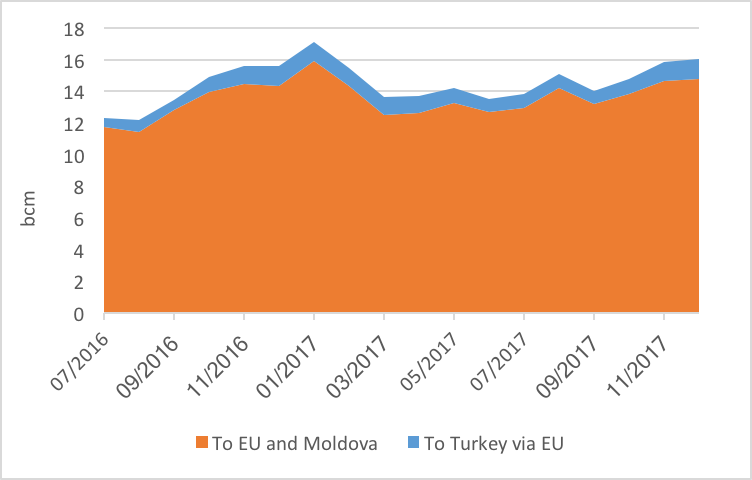 As the year has now ended, it is interesting to see that Gazprom used Ukrainian transit the most (47%) to export gas to the EU. The direct links (to Germany via Nord Stream 1, to Finland, to Estonia and to Latvia) accounted for 31%, followed by the Belarus route (22%). 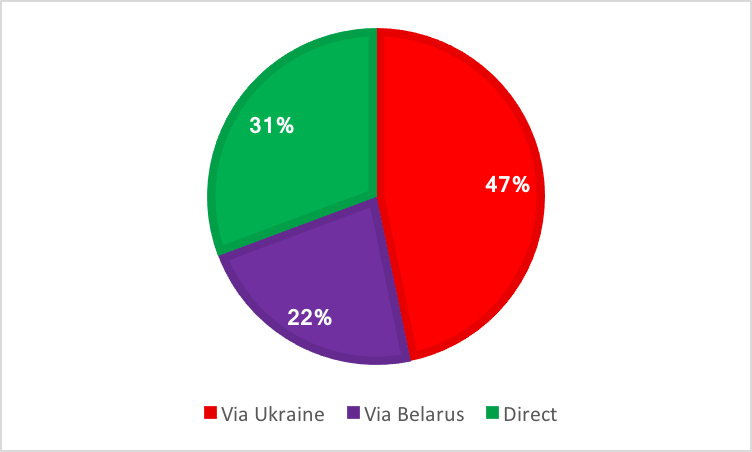 If we look at FY 2017 load factor, the pipes via Belarus were more used (74%) than the direct links (72%). But with the lifting of the ban on utilising full capacity on the German Opal, Gazprom should in 2018 prefer to use Nord Stream 1 at close to full capacity all year long. So, we should see direct flows and transit via Ukraine evenly split in 2018. The 8 January earthquake in Groningen should be followed by a further production cap reduction in the Netherlands. The load factor via Ukraine depends on the capacity assigned to there (from 89bn m³/yr to 120bn m³/yr) and is not so much relevant as it is the default choice for Gazprom.